DBM: Government employees to receive 2018 mid-year bonus starting May 15 - Balita Boss! The 2018 mid-year bonus for government employees will be released starting on Tuesday, May 15, according to Department of Budget and Management (DBM). According to Budget Secretary Benjamin Diokno, as posted by DBM on their Facebook page, the government has allotted a total of P36.2 billion for the extra pay of 1.5 million government employees. 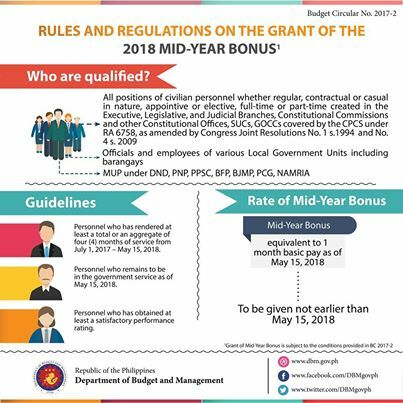 Check out below the rules and regulations on the grant of the 2018 Mid-Year Bonus. For more details, read below the Budget Circular No. 2017-2.